Boston Metblogs » Robert Hughes on Antonio Lopez Garcia. Robert Hughes on Antonio Lopez Garcia. There are some artists whose work compels assent almost as soon as you see it. Its seriousness announces itself in precision, gravity, lack of obvious fluidity; in a fastidiousness that could be modesty but is in fact the only kind of aesthetic pride that matters and lasts; in a respect for the eye’s power to surprise the mind, refracted through an intense engagement with tradition. Everything, in short, that is denied by the tyranny of the neo. The flavor of Lopez’s art is peculiar and difficult to describe in the abstract. 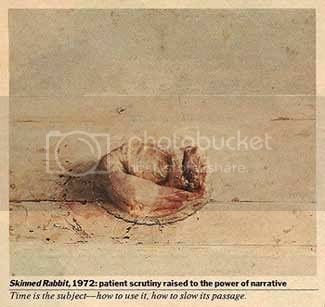 A good starting point is his small still life of a rabbit on a plate, dated 1972. It is just that, and no more: a rabbit skinned for roasting by a Spanish butcher, with its head left on; a glass plate with a scalloped edge; a kitchen table of pine covered with old cream paint, now scarred and stained, with bits of dark wood showing through; a band of gray wall with a mauve undercast. The table occupies a little over two-thirds of the depth of the painting, the wall the rest, and the corpse is huddled not quite in the center of the table. These slight departures from absolute regularity give the centered, single image a murmur, no more, of instability. The scheme is one of the most widely known in Spanish painting: the tradition of the bodegon, or kitchen still life, the isolated object against a plain field, brought to its fullest intensity by Zurbaran and Sanchez Cotan in the early 17th century. Echoes of the bodegones continued in Spanish art for hundreds of years; they could still be seen in Picasso’s cubist still lifes. But Lopez’s skinned rabbit goes straight back to the source, taking in a vivid memory of Goya’s still lifes along the way. MFA has a video interview.